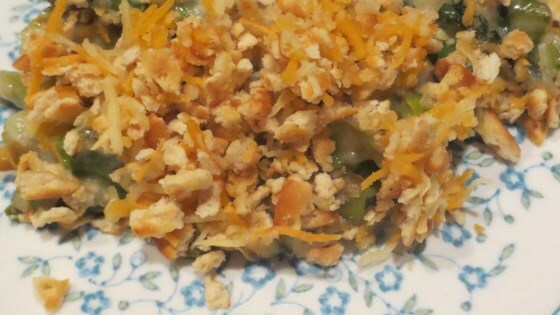 "This casserole is a staple at our holiday meals. Loaded with asparagus, cream of mushroom soup, and creamy cheese, it's sure to be a crowd-pleaser!" Place half the asparagus into the bottom of an 11x7-inch baking dish. Spread 1 can cream of mushroom soup over the asparagus. Top soup with 6 slices processed cheese. Layer on remaining asparagus, remaining soup, and remaining slices of processed cheese. Sprinkle cracker crumbs over the casserole; spread butter cubes evenly over the crumbs. Bake in the preheated oven until the casserole is bubbling and the cracker topping is lightly browned, about 45 minutes.